Are there any downsides to upright exercise bikes? If you’re looking to improve your personal fitness, whether that’s for serious athletic purposes or just for low-level personal health reasons, an upright exercise bike is a great choice. They’re smaller than a lot of other indoor fitness tools and easy and intuitive to use. Exercise bikes allow you to do intense cardio exercise or more casual cycling for lower fitness levels, all from the comfort of your own home, so you can reap all the health benefits of road cycling with far less effort required. They’re also far better for your joints than running, as they’re low impact and reduce the force running through your knees. Choosing the best upright exercise bike for your personal needs can be challenging in 2019, with so many options available. Fortunately, this guide is here to help you narrow down the wide market so that you can find the perfect exercise bike for your lifestyle. 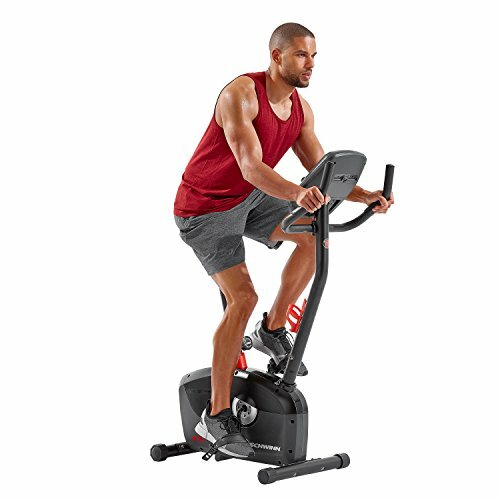 The Schwinn 170 Upright Bike offers a high level of customizability, making it suitable for any level of fitness or exercise plan. Coming with a full 25 different levels of resistance, this upright exercise bike can work for anyone from the completely unfit to the semi-professional athlete. It also features 29 different pre-programmed settings, offering something for every workout style. The mechanical parts of the bike are also impressive, with a weighted flywheel design for a more natural feel, making the experience far more like that of riding a road bike. On top of this, the Schwinn 170 features Bluetooth connectivity, syncing with a range of different fitness apps to help you to track your progress and goals easily and intuitively. Why We Liked It – The customisability is a strong selling point for the Schwinn 170 Upright Bike, allowing it to work well for a wide range of users. If you’re not sure what you want or expect your fitness levels to change rapidly, this exercise bike is a great choice. 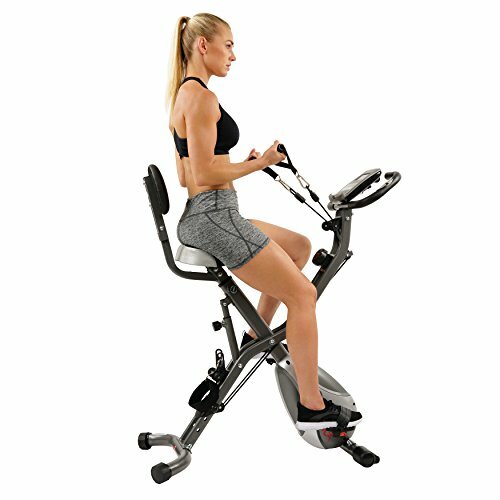 The Marcy ME-708 Upright Exercise Bike is an attractively designed piece of equipment with premium functionality. 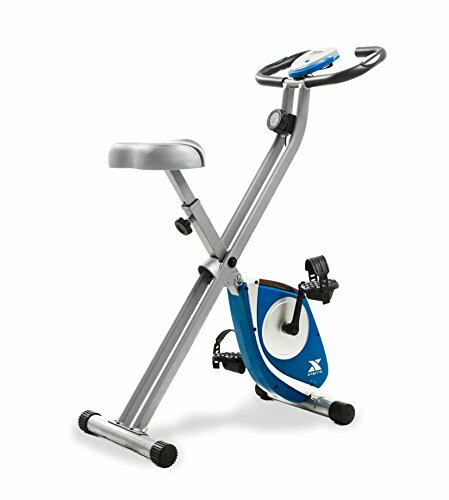 Offering counterbalanced pedals for maximum control as well as a magnetic resistance system for smooth, natural feeling tension adjustments, this exercise bike is designed to put the user completely in control. In addition to this, it has a fully adjustable seat, keeping the bike comfortable for users of any size. The feedback screen provides information on your time, speed, calories burned and distance, all in larger numbers than most of the competition, keeping all the information you might want clear and easily accessible at any moment during your workout. Why We Liked It – The Marcy Upright Exercise Bike ME-708 is designed to feel smooth and natural, its counterbalanced pedals and magnetic resistance system giving full control and the smoothest possible experience when shifting between resistance levels. The Nautilus U614 Upright Bike is an easily adjusted bike with a wide range of optional extras, ideal for anyone who wants to customize their cycling experience to perfectly fit their personal preferences. Both the handlebars and seat can be adjusted easily, with the seat post specifically designed to be easily removed and replaced with an alternative if there’s a different seat design that you find more comfortable. None of this compromises the integrity of the Nautilus U614’s design, however, as it still supports a maximum user weight of 300lbs. In addition to this, it comes with transport wheels for easy movement, allowing the bike to fit into smaller apartments or less permanent exercise setups. Why We Liked It – The extreme customizability of the Nautilus U614 Upright Exercise Bike is impressive, and its optional extras are worth a closer look, with everything from a media shelf to an inbuilt fan available to use should you want it. The XTERRA FB150 Folding Exercise Bike is a small, folding piece of equipment designed to be easily set up and put away whenever you need, ideally fitting a small space or mobile lifestyle. It is sturdily built, secure, and reliable, and should be more than able to survive regular use, assembly, and disassembly. The seat is well padded, as is the handlebar arrangement, ensuring a higher level of comfort that might be expected from such a compact folding bike, and the resistance is easily adjusted with a large manual tension knob, allowing the XTERRA FB150 to fit the workout needs of users of all fitness levels. Why We Liked It – The XTERRA FB150 is ideal for anyone who lives in a small enough space to need a collapsible exercise bike or intends to transport the bike a lot. It may not look like much, but it offers more comfort than might be expected from such a compact product. 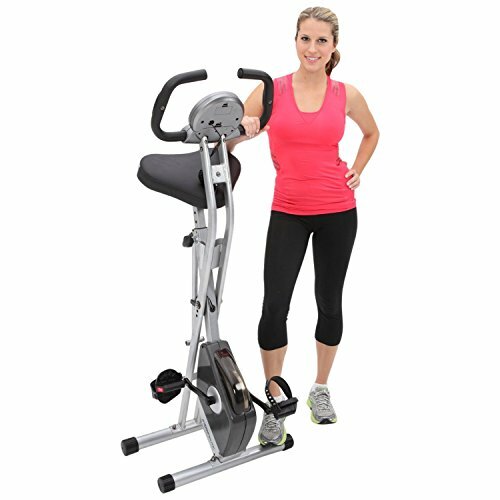 The Exerpeutic Upright Exercise Bike is a sturdy, folding device, designed to be packed away in a relatively tight space. Coming with inbuilt transportation wheels, it can be easily moved out of the way, preventing it from dominating the room. It has an extra-large seat cushion for comfort for users of all sizes, and can be adjusted in height to fir users ranging from 5’3” to 6’1”. In addition to this, it offers a hand pulse monitor built into the handlebars, keeping track of your heart rate and displaying it on the LCD screen mounted at the front of the bike. Why We Liked It – Larger and sturdier than other folding exercise bikes, this Exerpeutic model still folds away to fit a relatively small space. It’s a great compromise between the features and stability of a stationary exercise bike and the compact size of a smaller folding bike. 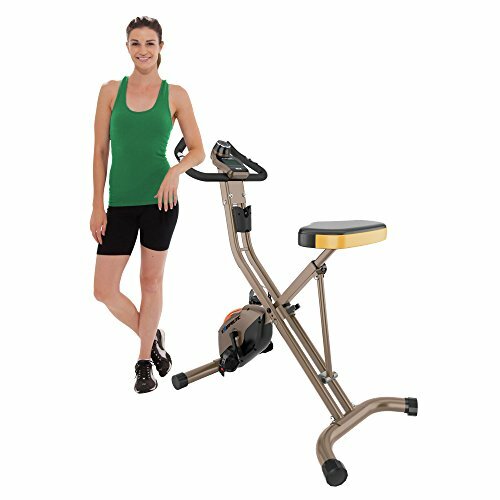 The Exerpeutic Gold 500 XLS Upright Bike is a larger folding bike with most of the extra features of a stationary exercise bike. Ideal for smaller spaces in need of a bike that won’t dominate the room, the bike folds easily to be packed away when not in use. As well as folding to half its erect size, this exercise bike offers exceptionally sturdy construction. Made from heavy duty durable steel, the Exerpeutic Gold 500 XLS can support a maximum weight of 400lbs, 100lbs higher than most competitors can sustain. The seat cushion is correspondingly oversized, offering extreme comfort to users of all sizes and body shapes. Why We Liked It – The Exerpeutic Gold 500 XLS Upright Bike is far sturdier than most of the competition, despite its folding construction. It’s a great choice for a more intense workout in a smaller space, easily staying out of the way in a busy room. The ProGear 225 Foldable Upright Bike is a lightweight and compact foldable upright exercise bike, packing substantial exercise power and some handy bonus features into a small, folding space. Ideal for smaller living spaces, it can be easily folded and packed away, and the seat is sufficiently adjustable to allow it to fit taller users of up to 6’ in height. It also offers an ergonomic, comfortable seat, and pulse sensors built into the handlebars to monitor your heart rate. The lightweight construction makes this an ideal choice for those who need an easier to move option in their workout routine. Why We Liked It – The number of features packed into the ProGear 225 Foldable Upright Bike is impressive. It offers extras such as the heart rate monitor that might not be expected from a folding bike, giving it added functionality in a small package. The Sunny Health and Fitness SF-B2710 folding exercise bike is another option ideally suited to those with limited workout space available. Folding down to a relatively small space, it can be easily packed away when out of use. This one is a little unusual, however, in that it is structured as a semi-recumbent exercise bike, with the pedals mounted slightly forward of the seat. Not fully forward like a recumbent bike, this pedal arrangement allows for a riding experience a little more like that of a recumbent bike without compromising the handy foldability of the upright folding design. 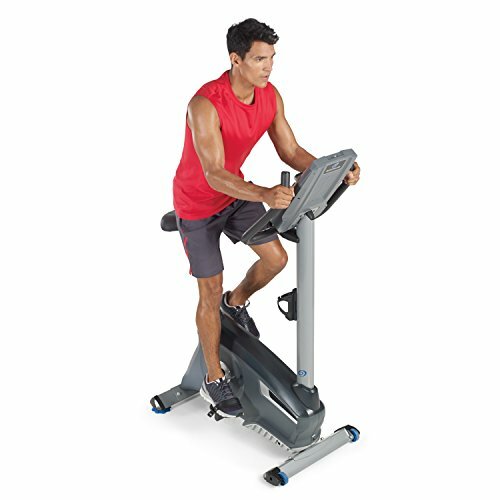 In addition to this, the Sunny Health and Fitness SF-B2710 comes with arm and leg resistance bands, allowing a more full-body workout than most exercise bikes. These can be tightened or loosened as needed, allowing you to customize your workout to fit your personal needs. Why We Liked It – The arm and leg resistance bands help the Sunny Health and Fitness SF-B2710 exercise bike stand out from the crowd, negating the primary shortcoming of most exercise bikes by allowing more of a workout for other muscle groups. The Schwinn A10 Upright Bike is a simple, accessible model for those who do not want unnecessary features and flourished from their exercise bike. 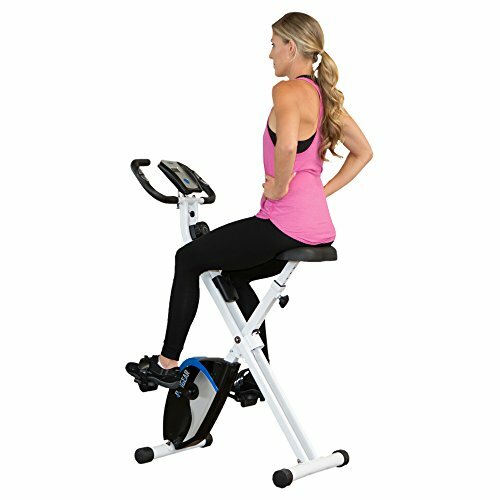 Designed to be clean and easy to use, this model of exercise bike offers a simple 7 workout programs to give a moderate but not overwhelming level of customization, and 8 levels of magnetic resistance to adjust to a wide range of fitness levels. The magnetic nature of the resistance control offers a smooth shifting experience as you change between resistance levels, and the one concession to additional features is the presence of a pulse monitor in the handlebars. This pulse monitor presents its reading on the LCD feedback display, which is designed with extra-large text for easier reading. Overall, the Schwinn A10 Upright Bike offers a simple and accessible user experience with just enough features to keep the bike customizable and comprehensive. Why We Liked It – The Schwinn A10 Upright Bike is a simple, accessible choice for anyone who isn’t particularly bothered about fancy extra features. It offers just enough complexity to be useful, without ever feeling overwhelming to those who just want a simple exercise option. There are many different considerations that might affect your purchasing decisions. It is important to think about what your specific needs are before you buy. How much space do you have available? Would you prefer an intense workout or a more casual experience? Do you want an experience closer to riding a road bike, or simply an exercise experience? None of these exercise bikes should be actively uncomfortable, but some have more padding than others. Consider the size and padding of the seat of your chosen bike, as well as the ergonomic design of the seat cushions. All of these factors affect your comfort when exercising for extended periods of time, and so are worth thinking about before you make a purchase. Folding exercise bikes are far easier to transport than their stationary cousins but might be a bit less stable than most alternatives. Some of the larger folding options, however, offer transport wheels mounted on the base, enabling easy movement of even a slightly larger bike. These are intended more for short-distance transport, however; they are ideal for moving around your house, but will not be sufficient for moving your exercise bike between locations. Upright exercise bikes like these provide a large part of the exercise bike market, but before purchasing a bike trainer, it is worth considering what your preferred posture is when riding a bike and choosing the model that best fits your preference. Reclining indoor bike trainers also take up substantially more space than upright ones, requiring enough room for the rider to lie down, and so provide more of a luxurious option for those with room to spare. The upright bikes listed above provide most of the same benefits while taking up a far smaller footprint, however, so should be ideal for most purposes. 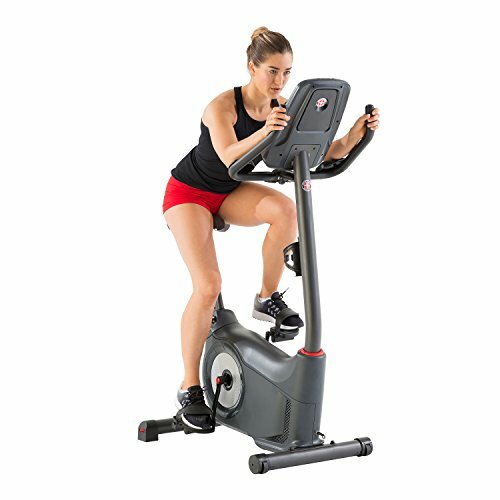 Upright exercise bikes offer a great way to get extreme cardio exercise in the comfort of your own home, allowing for an easy intense workout. They’re far smaller and easier to fit into a home workout space than a cross-trainer or a treadmill and allow a similarly intense exercise routine. However, they’re not entirely perfect. Staying in a seated position for a long period of time has the same consequences in any situation, even if you’re pedaling hard. When cycling, your hips don’t move very much, so you can suffer the same sort of muscle shortening that you might get from sitting at a desk all day. In addition to this, it won’t provide the full range of muscle work that other types of cardio training may help with. Stationary cycling is great to train for further cycling activities but focuses very closely on the thigh and calf muscles with minimal work put into the gluteal muscles, the largest in the body. Several of these models offer flywheel mechanisms, a term that can seem confusing. Flywheels mimic the chain-linked dual wheel mechanism of a road bike and take up correspondingly more space than a single wheel design. Single wheel exercise bikes allow for a more compact model, letting them be packed away more easily, while the flywheel models provide a riding experience far closer to that of a road bike. When accelerating, the flywheel design spins up more naturally and comfortably than any equivalent single-wheel model, and some designs even offer adjustable flywheels that can be moved between two different configurations. This allows for an even harder workout for more dedicated users but is only rarely combined with the convenience of a folding structure. There is a wide range of upright exercise bikes on the market in 2019, and there should be something out there to suit every personal need imaginable. There are great options available for any level of fitness, and any of the models listed above should help you to achieve your fitness goals with comfort and confidence. All of these have their different strengths, and which of them is the right choice for you will depend entirely on what your personal needs and exercise regime happen to be. Considerations such as stability and space are likely to be your major concerns, limiting your options more than the more optional categories such as screens and flywheels. This guide will hopefully have provided the information that you might need to determine which bikes best fit your personal exercise preferences, and enable you to make a purchasing decision with full confidence. The decision may look intimidating to begin with, but any of the options above would be a perfectly good choice.